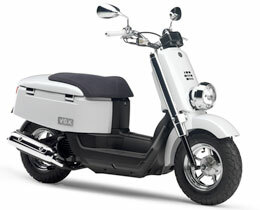 YAMAHA PRESS INFORMATION | Yamaha Motor Co., Ltd. This model boasts the first fuel injection system ever on a Yamaha 50cc scooter. It fits into today's street fashion with its box-like body, flat sides and abundant trunk space. With higher handle bars for more comfortable riding position and a good sense of size, its long wheel base and fat tires, this model has the look of spacious ease and a ride that is comfortable and enjoyable. 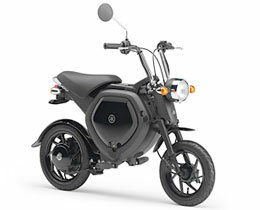 This is a second generation model inheriting the "Light, Smart, Clean and Silent" concept of the "Passol" (50cc class) released by Yamaha in November of 2002 (limited regional release, followed by nationwide release in May 2003) as the first EV (electric vehicle) running solely on electric power. Mounting a motor with the same performance as the EC-02 released in May of 2005 and a battery with boosted energy concentration, this new model features improved start-up/mid-speed range and hill-climbing power and increased running distance per charge (25~30 km/55 kg rider in normal around-town riding). *This model will be released on Nov. 9, 2005. As one aspect of Yamaha's corporate objective of "sustainable development," we are engaged in the development and market release of EVs (electric vehicles) that run solely on electricity as people-friendly vehicles with minimized environmental impact. 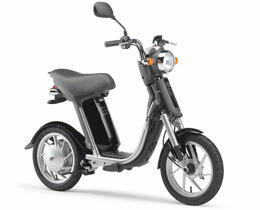 The "EC-02" released in May of 2005 is Yamaha's second EV, following the Passol. This is a model developed to offer "design and performance that stimulates the spirit of fun in adults" while pursuing the qualities of gentleness, fun and ease of use that only an electric vehicle can provide.